Background: In recent years, more evidence have progressively indicated that Long non-coding RNAs (lncRNAs) play vital roles in wide-ranging human diseases, which can serve as potential biomarkers and drug targets. Comparing with vast lncRNAs being found, the relationships between lncRNAs and diseases remain largely unknown. Objective: The prediction of novel and potential associations between lncRNAs and diseases would contribute to dissect the complex mechanisms of disease pathogenesis. Method: In this paper, a new computational method based on Point Cut Set is proposed to predict LncRNA-Disease Associations (PCSLDA) based on known lncRNA-disease associations. 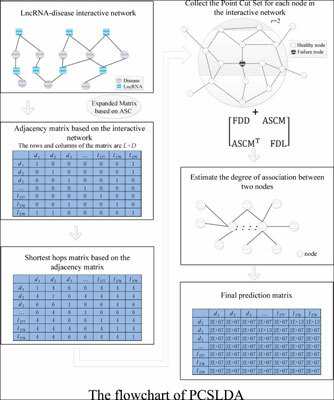 Compared with the existing state-of-the-art methods, the major novelty of PCSLDA lies in the incorporation of distance difference matrix and point cut set to set the distance correlation coefficient of nodes in the lncRNA-disease interaction network. Hence, PCSLDA can be applied to forecast potential lncRNAdisease associations while known disease-lncRNA associations are required only. Results: Simulation results show that PCSLDA can significantly outperform previous state-of-the-art methods with reliable AUC of 0.8902 in the leave-one-out cross-validation and AUCs of 0.7634 and 0.8317 in 5-fold cross-validation and 10-fold cross-validation respectively. And additionally, 70% of top 10 predicted cancer-lncRNA associations can be confirmed. Conclusion: It is anticipated that our proposed model can be a great addition to the biomedical research field. Keywords: Point set cut, interactive network, LncRNA-disease associations, prediction, lncRNA similarity, disease similarity. Keywords:Point set cut, interactive network, LncRNA-disease associations, prediction, lncRNA similarity, disease similarity.